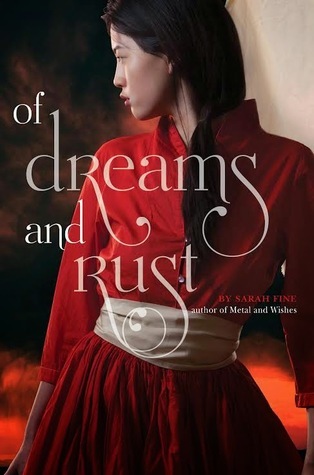 What if the Phantom of the Opera Was a Cyborg: Of Dreams and Rust by Sarah Fine | Howdy YAL! Of Metal and Wishes was one of my favorite books in 2014, BUT I didn’t think it needed a sequel. The end of that book ended on such a bittersweet note, that I was sort of happy with how it was resolved. But low and behold, it was announced that this was going to be a duology and, well, I was sort of interested in how things were going to progress. Hoping that it wasn’t going to be a cop out AT all. The result Of Dreams and Rust wasn’t bad per say, but it felt like something was missing. To be fair though, overall I recommend the book AND I am recommending the series with some minor reservations to anyone who is in an Eastern inspired steampunk fantasy with nods to Phantom of the Opera. What worked about Of Dreams and Dust. A lot of things worked. Character development being one of them. Wen really grows as a person in this installment, but she still has her faults. Same with the rest of the characters in this series. However, even though Wen does grow, I do wonder about some of her decisions. Her whole getting on the train and running away, seemed a little stupid to me. I get it had to happen to accelerate the part, but she was really made some downright idiotic decisions. And is in desperate need of a sassy gay friend. What she wasn’t in need of was Bo. Oh, God, did he annoy me. Even though he is now basically a really cool cyborg or Ironman wannabe depending on how you define cyborg. However, I don’t think his upgrade really helped his case. Honestly, I don’t know how anyone would ever ship Bo and Wen especially after this installment. All he does is whine and moan, before doing something relatively helpful that might make you question why you hate him so much. Well, I don’t feel guilty about not liking you Bo. The actual ship in this book is quite delicious. It was developed a lot this installment, and I like how the character acknowledged that they have a lot to learn about each other. Like with Of Metal and Wishes, Of Rust and Dreams has vividly creepy imagery. It’s probably it’s biggest strength. Also, the plot doesn’t try to be gentle it’s brutal. Although, I did feel like the build up was a bit minimum-a filler novella that would’ve given us some insight into that missing year would’ve been helpful. I’d say investing in this duology is worth while. It’s short and quick, and has some great character development. Although, it has it’s faults they were relatively minor-though I do think a little optional novella would’ve really filled in some much needed gaps.